This post is “s-no-w” joke. Honestly, it’s not. You might be surprised to learn snow does fall on Hawaii almost every Winter. 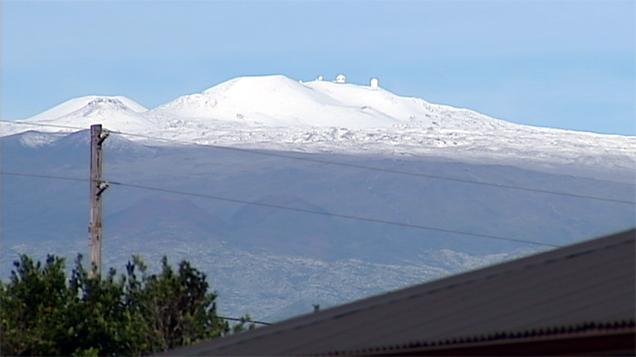 Just a few days ago, Hawaii’s Big Island peaks of Mauna Loa and Mauna Kea got a beautiful blanket of snow. You can read the news about it and see a video here. Hawaii’s many diverse climates really fascinate me. We often think of Hawaii as being a tropical beach paradise. So, it’s puzzling to accept that these Hawaiian Islands receive snow – considering that they are situated in the middle of the Pacific Ocean and near the equator! The following photo is from our collection when we toured the top of Mauna Kea for sunset and stargazing back in March 2008. What a mind-boggling scene to see snow on volcanic cinder cones. This next photo of the sunset we enjoyed that day. It’s not often you see Hawaii sunset photos with snow. Don’t worry that snow will ruin your Hawaii vacation. Only the peaks of Mauna Kea, Mauna Loa on the Big Island and occasionally Haleakala on Maui experience any snow. So, no need to pack the parka for your sun soaking beach time. I read about this Sheila but didn’t see any pics or video. So cool!! That is great that the people in Hawaii actually do get to see and experience snow without having to fly to the mainland. Beautiful! Hi Janet – Hmmm…wonder why the pic and video aren’t displaying for you? Dd you mean the photos weren’t displaying in the post itself? My photos are hosted on flickr. I wonder if flicker might have been down briefly when you looked? Either way, seems like it was acting wacky. Amazing pics of Hawaii. The sunset photo is looking very beautiful. Too funny! The comments are good. 🙂 I still haven’t seen snow! We may not have to fly to the mainland but we still have to fly! Thanks, Sheila, for sharing! OMG! I actually got a visual of the snow melting through a cardboard box on the way to the post office! I need a vacation! LOL!